Courtney and Brandon Robinson love to fly-fish for Guadalupe Bass in the South Llano River. [Courtney] We’re not looking at a whole lot of deep pools, it’s more shallow water, skinny water. [Brandon] Fish on! This is why I love catching Guad’s, their little fish, but they use the river to fight! [Courtney] Um so we’re gonna see little bass in the shoal’s area like in that little rapids area over there. Oh, there we go! The state fish of Texas wasn’t always easy to catch. It was on the brink of disappearing from the South Llano, due to introduced Small Mouth Bass that crossbred with the native Guadalupe for decades! They can breed with each other and what results is what we call a hybrid, and those fish, they’re not our pure native Guadalupe bass, so we’re trying to restore these populations throughout the state. We’re stocking large numbers of these pure fingerlings, and what the goal is these pure fish outnumber the Hybrids and so we reduce that overall hybridization rate and get it back to where we have almost an entirely pure population of Guadalupe Bass. But the data shows the Guadalupe Bass are back. We’ve been working on the Guadalupe Bass here in the Texas Hill country for about twenty-five years, and been really successful in restoring these populations in these iconic Texas hill country streams, and now we have Guadalupe Bass in a lot more reaches of these streams here for people to enjoy! Reel in an eyeful of Guadalupe bass the week of September 23 on the Texas Parks and Wildlife TV show on PBS. 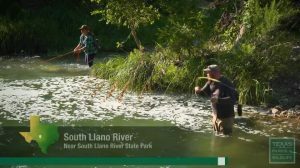 This entry was posted on Tuesday, September 11th, 2018 at 12:00 am	and is filed under Conservation, Fishing, Freshwater, Guadalupe Bass, Research, SFWR, TPWD TV. You can follow any responses to this entry through the RSS 2.0 feed. You can skip to the end and leave a response. Pinging is currently not allowed.